in 1985 for Memphis, Italy. We have a large collection of this plate so you can order a complete dining set. 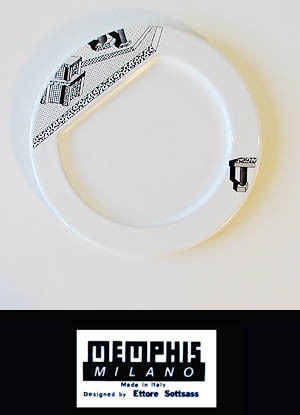 Each plate is stamped with the "Memphis Ettore Sottsass" logo on reverse. Each plate is new in original box. About Memphis: Memphis was founded in 1981 by architect Ettore Sottsass and a group of young Milanese architects and designers. The playful colors, materials and motifs of the furniture, ceramics and glassware was unveiled by memphis designers at the 1981 milan furniture fair. Memphis split the design world and caused a media sensation after years of drab rationalism. Memphis Milano became the radical design movement that achieved iconic status. Now part of museum collections world wide.